Melsteel recently worked on a project at Oatlands Preschool. 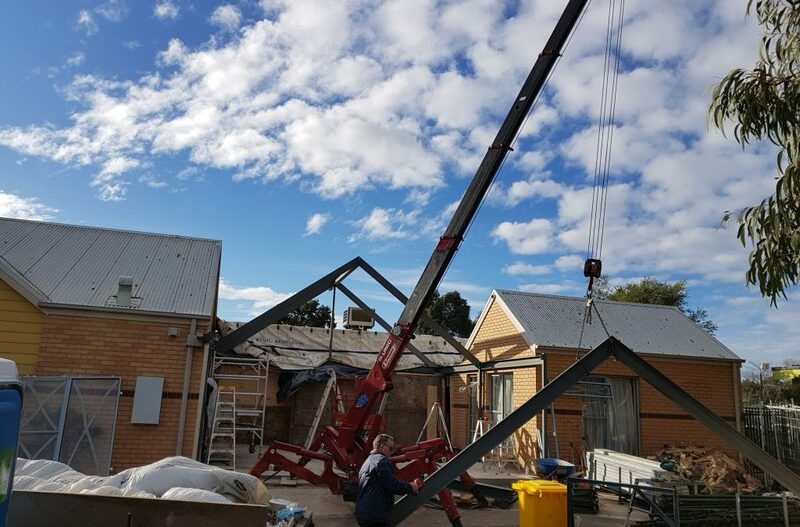 We had the task of setting up the steel support beams for a new room in between two pre-existing buildings. Our erection team worked with the client to supply the right size and amount of steel support beams to fit in the available space. Our crew carefully set up the supports with our on-site crane and a steady hand. It is common to have wood support beams in residential homes, however in high-traffic buildings such as hospitals, offices, schools and stores, steel is the preferred material due to it’s long term strength and endurance. Steel support beams can bear greater weight than other forms of beams, in particular they are resistant to most weather conditions and can withstand other heavy materials such as stone, brick and marble that may be used in conjunction with the steel structure. At Melsteel, we source and install industrial-grade materials you need to complete the job. We will cut your steel to fit to your requirements and erect on-site with our qualified crew. This Oatlands Preschool building is now completed and will be enjoyed for years to come with its structurally sound supports. Contact us at Melsteel for your next project.